I love food, breakfast lunch and dinner, i love it all. I'm going to use this page to share with you some recipes, ideas and nutritional guidance for all your food cravings. Helping you understand you can still indulge in your favourite meals, with useful tips to make sure the aftermath is not always feeling guilty and regretting the indulgence. How can you make your favourite dishes still deliciously tasty but more nutritious? Are you lacking creativity in the kitchen, and see a microwave meal as the quickest, easiest options. I will provide speedy, simple cooking tips and recipes that will still get your tastebuds tingling without having to pierce a film lid. Pizza is probably one of my faves, always my go to hangover cure or junk food fix. So sometimes you just gotta get that cheesy goodness but minus all the calories and stoginess of the dough! Whatever your toppings, you can make a really tasty version of your favourite pizza and it takes about 5 minutes... if that! Wack the grill on high..
Wholemeal or white pitta bread i usually slice mine in half so it's really thin and crispy when cooked. Any other toppings you like! My favourites are; anchovies and olives, ham mushrooms and rocket or sundried tomatoes with mozzarella for extra cheesiness! When you've assembled, pop your pizzas under the grill for about 3-5 mins. Voila you have a pizza in no time! ENJOY!!! These quantities will make around 4/5 small pancakes or 2 large ones. All you do is peel and mash up the banana in a bowl, crack the eggs into the bowl and mix. Grease the frying pan with whatever you have in the cupboard- coconut oil, marj, butter and pour in your desired amount. Flip till nicely browned on each side and serve! So simple and so so good, i usually top mine off with some greek yoghurt, fruit and seeds but get creative and go wild! I LOVE CHOCOLATE, i take after my mother! STICK WITH ME!!! I know it sounds gross. Break the chocolate up into chunks and melt, make sure all the chocolate is fully melted. Drain 1 tin of chick peas, the leftover juice is the stuff you need. Whisk this liquid until it goes thick and white (like egg whites) and add to melted chocolate. Mix thoroughly and pour into little cups or pudding trays. Cover with cling film and pop in the fridge! This recipe couldn't be easier, it absolutely delish, perfect for a sweet treat on a budget and nutritional too!! Breakfasts are the best, healthy breakfast cookies. Since moving in with my love George i must say i have become quite the little host. 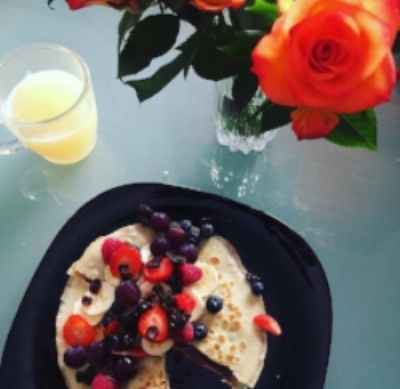 I love hosting a breakfast morning for my girls, where we all have creative jobs we all work sporadic hours so fortunately none of us are stuck behind a desk from 9-5 which means we can usually squeeze a breakfast morning in at some point during the week. And we absolutely love them, a chance to gossip, talk girlie things and eat which is all of our favourite thing to do. I have been making breakfast cookies flapjacks and they couldn't be easier. I never follow a recipe, i literally throw everything in a bowl slop a ball shaped mould onto a non stick tray and bosh into a pre-heated oven for around 10-15 minutes (until slightly golden ontop but still gooey and delicious in the middle). So here's some ingredients i add to my healthy breakfast cookies. Have you got a sweet tooth? Find yourself craving a chocolate bar in the middle of the day? but often feel bad for giving into that craving. I find packing enough food to last me the day keeps the cravings at bay. Here is my super easy banana bread recipe, perfect for a sweet tooth craving but totally nutritious, packed full of energy and promised to not leave you wanting that chocolate bar. First mash the bananas, and add the softened butter and beaten egg. Mix into flour and caster sugar, then add vanilla extract, baking powder, bicarb of soda and handful of chosen dried fruits. Sprinkle nuts on top before baking for 40-60 minutes on 180 C (depending how moist you want your bread, make sure to check by sticking a knife into the middle and making sure when you pull it out it comes out clean.) Let cool and ENJOY. The perfect treat for a jam packed day. Quick and easy veg lasagna. Lasagne is my absolute favourite meal. It’s just delicious, meat, pasta, sauce, cheese it’s got it all!! Although it is my absolute favourite, there’s no denying it holds a fare few calories as well as taking an absolute age to prepare and cook. Next time you’re thinking of cooking a lasagna but don’t want all the calories that go with it, why not swap the meat for veg and cut down the prep time, still guaranteed to be just as delicious, and better for the waistband. I like to make my vegetable lasagna by firstly making a tomato sauce with all my leftover veg, the usual culprits are; onions, garlic, carrots, celery, courgette, sweetcorn, tomatoes, spinach, mushrooms. There are no rules when making this sauce. Anything you add will taste nice with a dash of pepper, salt if needed and mixed herbs, I also add a splash of worchester sauce and a squirt of tomato paste, but this is all optional! It couldn’t be easier. If you want to be really good you can even use raw coconut oil instead of olive oil when firstly frying onions. The longer you cook the softer the veg will turn out. For the béchamel sauce, to cut down on the calories you can swap the butter and flour for soft cheese or greek yoghurt. I was making a veg lasagna a while ago and didn’t have any flour, so I mixed low fat soft cheese with milk and added pepper and nutmeg and a sprinkling of mature cheddar and it was delish. You can do exactly the same with greek yoghurt. Again if your calorie counting you can use coconut milk or almond milk instead of skimmed/semi skimmed or full fat cows milk. Pasta is my favourite type of food, so making a lasagna without pasta sheets to me is a crime, but if you’re looking for a carb free version of this tasty dish then just swap pasta sheets with layers of spinach or layers of aubergine. Anything works so don’t be scared to be creative. So meat or veg, pasta or no pasta cheese or no cheese this dish will always be an absolute banger and however it’s served it’s a winner in my eyes.